Motorcycle Friendly is more than just a marketing hook at Hotel Los Arcos de Sonora in Banamichi. We are the Sonoran Motorcycle Touring Center. We understand motorcyclists because we are riders too. Our rooms have space to hang your gear and space to stash your helmet. We have secure off street parking and a well equipped tool box should you need to do some wrenching. We know the shops in Hermosillo and Southern Arizona and we know the local lllanteras (tire repair guys) and motorcycle savvy mechanics. Since we also own and operate Turkey Creek Motorcycle Tours we spend a lot of time riding and exploring the Rio Sonora and Mexico. We also host an annual motorcycle meet up in Banamichi where riders can get together, enjoy the local roads and the local culture. We have been the first stop for many groups and individuals traveling to the Copper Canyon, Central Mexico,Folks crossing to and From Baja, into Central America and beyond. We have hosted several riders on their way to South America and to “Fin del Mundo” at Ushuaia, Tierra del Fuego. Come on down for a visit and sit by the fireplace at ride’s end. We’ll talk about bikes and destinations and swap stories while sipping some local Bacanora and planning the next adventure. 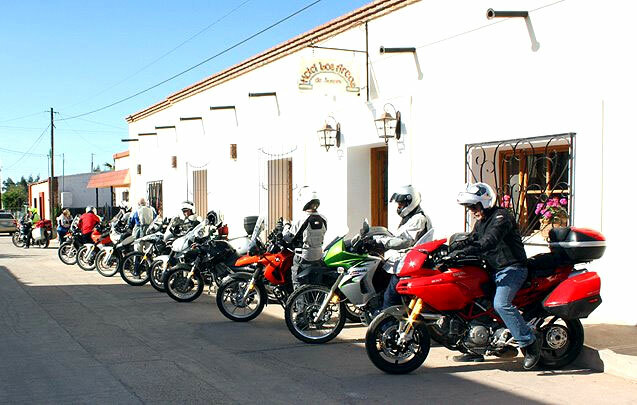 Make Hotel Los Arcos de Sonora in Banamichi your base for two wheeled Mexican adventure. Who knows, we may even join you when you ride out. Be sure to read about our hotel and about riding in Mexico in BMW Owner’s News.